Why have just another artery clogging burger with a plain old bun, when you could be enjoying two grilled cheese sandwiches enveloping your burger? 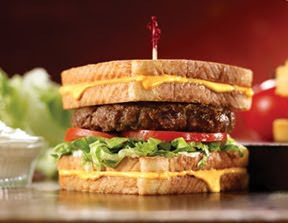 I present the new Friendly's Grilled Cheese Burgermelt. The day is coming when food like this is going to be hit with a 100% tax surcharge.